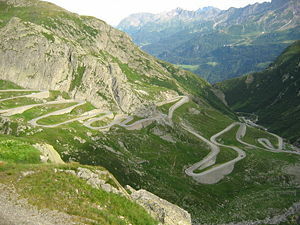 The Saint Gotthard Pass road with hairpin turns in the Swiss Alps. A road is an identifiable route, way, or path for the passage of people, vehicles, or animals between two or more places. Roads are typically smoothed, paved, or otherwise prepared to allow easy travel, although they need not be. Historically, many roads were simply recognizable routes without any formal construction or maintenance. Roads that pass through a city, town, or village are often known as streets. Society depends heavily on efficient, well-maintained roads. They provide the infrastructure for the transport of people and goods. Thus they contribute to the freedom of travel and economic health. In addition, they contribute to urban space easement. Road construction, however, needs to take into consideration the environmental impact of the construction process and the traffic that will use the road. Interstate 80, the second-longest U.S. Interstate highway, runs from California to New Jersey. This image was taken near Berkeley, California. Castle Roads, in Bermuda, as depicted in a nineteenth-century military map. This is an example of the maritime application of the word road. A misty road in Australia, entering into a township. In original usage, a "road" was simply any pathway fit for riding. The word “street,” which can be traced to the Latin strata, was kept for paved pathways that had been prepared to ease travel in some way. Thus, many "Roman Roads" have the word "street" as part of their name. Roads are a prerequisite for road transport of goods on wheeled vehicles. Words with related usage include, Avenue, Boulevard, Court, Drive, Freeway, Highway, Lane, Street, Turnpike and Way. 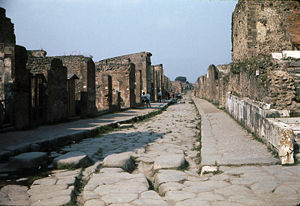 A cobblestone road runs through the ancient city of Pompeii. The deep ruts were probably generated by the wheels of numerous carts that used the road. It has been suggested that some roads may have originated when humans began following animal trails. The Icknield Way, known as the oldest road in Britain, is given as an example of this type of road, as it is a natural course that has been used by both humans and animals. Others have noted that animals do not follow constant paths, implying that the origins of roads cannot simply be traced to animal trails. Whatever the case, it appears that rough pathways were used by human travelers by about 10,000 B.C.E. Some highlights of road construction since about 4000 B.C.E. are given below. The city of Ur in the Middle East had stone-paved streets dating back to 4000 B.C.E. Corduroy roads (made of sand-covered logs) have been found dating to 4000 B.C.E. in Glastonbury, England. Sweet Track causeway in England is one of the oldest known engineered roads and the oldest timber trackway discovered in Northern Europe. Tree-ring dating (dendrochronology) indicates that it was built in the winter of 3807 B.C.E. or spring of 3806 B.C.E. Brick-paved streets were used in India as early as 3000 B.C.E. In 500 B.C.E., Darius I the Great started an extensive road system for Persia (Iran), including the famous Royal Road, which was one of the finest highways of its time. The road remained in use after Roman times. From about 312 B.C.E., the Roman Empire built straight strong stone Roman roads throughout Europe and North Africa, in support of its military campaigns. At its peak, the Roman Empire was connected by 29 major roads moving out from Rome and covering 78,000 kilometers or 52,964 Roman miles of paved roads. 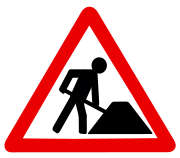 In the 1600s, road construction and maintenance in Britain was traditionally done on a local parish basis. This resulted in roads that were poor and variable in condition. To remedy this, the first of the 'Turnpike Trusts' was established around 1706, to build good roads and collect tolls from passing vehicles. Eventually, there were approximately 1,100 Trusts in Britain and some 36,800 km of engineered roads. The Rebecca Riots in Carmarthenshire and Rhayader from 1839 to 1844 contributed to the demise of the system in 1844 and the establishment of a Royal Commission. Beginning around 1740, there appeared the horse-drawn boat, a hybrid of road transport and river transport. In this arrangement, the horse followed a cleared path along the canal or river bank while pulling a barge or boat. Heavy bulldozers, such as the Caterpillar D9, are powerful tools, making them highly suitable for large earthmoving projects. Ride-on with articulating-swivel (small machine). Road construction requires the creation of a continuous right-of-way, overcoming geographic obstacles and having grades low enough to permit vehicular or foot travel. (pg15) It may also need to meet standards set by law or official guidelines. Old road surfaces, fences, and buildings may need to be removed before construction can begin. Trees in the road construction area may be marked for retention. Topsoil within the area of a protected tree's drip line should not be removed, and the area should be kept clear of construction material and equipment. Compensation or replacement may be required if a protected tree is damaged. Typical pavement stratum for a heavily traveled road. When a single carriageway road is converted into a dual carriageway by building a second separate carriageway alongside the first, it is usually referred to as duplication or twinning. The original carriageway is changed from two-way to become one-way, while the new carriageway is one-way in the opposite direction. In the same manner as a railway line may be converted from single track to double track, a new carriageway is not always constructed directly alongside the existing carriageway. Like all structures, roads deteriorate over time. Deterioration is primarily due to accumulated damage from vehicles, but environmental effects such as frost heaves, thermal cracking, and oxidation often contribute. According to a series of experiments carried out in the late 1950s, called the AASHO Road Test, it was empirically determined that the effective damage done to the road is roughly proportional to the fourth power of axle weight. A typical tractor-trailer weighing 80,000 pounds, with 8,000 pounds on the steer axle and 36,000 pounds on both tandem axle groups, is expected to do 7,800 times more damage than a passenger vehicle with 2,000 pounds on each axle. Pavements are designed for an expected service life or design life. In some countries, the standard design life is 40 years for a new bitumen and concrete pavement. Maintenance is considered in the whole life cost of the road with service at 10, 20, and 30 year milestones. Roads can be designed for various lifetimes, such as 8, 15, 30, and 60 years. When pavement lasts longer then its intended life, it may have been overbuilt, and the original costs may have been too high. When a pavement fails before its intended design life, the owner may have excessive repair and rehabilitation costs. Many concrete pavements built since the 1950s have significantly outlived their intended design lives. Some roads, such as Chicago's "Wacker Drive" (a major two-level viaduct in the downtown area), are being rebuilt with a designed service life of 100 years. Virtually all roads require some form of maintenance before they come to the end of their service life. Maintenance treatments for asphalt concrete generally include crack sealing, surface rejuvenating, fog sealing, micro-milling and thin surfacings. Thin surfacing preserves, protects and improves the functional condition of the road while reducing the amount of routine maintenance, leading to extended service life without increasing structural capacity. Transport economics is a branch of economics that deals with the allocation of resources within the transport sector. It is closely associated with civil engineering. Transport economics differs from some other branches of economics in that the assumption of a space-less, instantaneous economy does not hold. People and goods flow over networks at certain speeds. Advanced ticket purchases are often stimulated by lower fares. The networks themselves may or may not be competitive. A particular trip may require bundling the services provided by several firms, agencies, and modes. Although transport systems follow the same supply and demand theory as other industries, the complications of network effects and choices between non-similar goods (such as car and bus travel) make it difficult to estimate the demand for transportation facilities. The development of models to estimate likely choices between non-similar goods in transport decisions, called "discrete choice" models, led to establishment of the important branch of econometrics, for which Daniel McFadden received a Nobel Prize. In transport, demand can be measured in terms of numbers of journeys made or total distance traveled across all journeys. Examples are passenger-kilometers for public transport and vehicle-kilometers of travel (VKT) for private transport. Supply is considered a measure of capacity. The price of the good (travel) is measured using the generalized cost of travel, which includes both money and time. The effects of increasing supply (capacity) are of particular interest in transport economics, as the potential environmental consequences are significant. 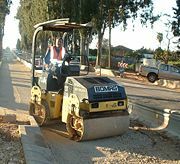 Road building and maintenance are areas of economic activity that remain dominated by the public sector, though private contractors are often used. Roads (except those on private property not accessible to the general public) are typically paid for by taxes (often raised through levies on fuel), though some public roads, especially highways, are funded by tolls. Prior to the advent of the internal combustion engine, a principal environmental effect was production of excrement from horses, cattle, and other animals on the streets. In the nineteenth century, this issue became significant enough for some European city officials to call for more cleanliness on the roads. Beginning in the twentieth century, the excrement problem was overshadowed by issues about vehicular noise and the emission of air pollutants. Some are also concerned about the disturbance of natural habitats by the establishment of roads that cut through them. Motor vehicle traffic on roads generate noise pollution, especially at higher operating speeds. Therefore, considerable noise-related health effects are expected from road systems used by large numbers of motor vehicles. The idea that road design could involve acoustical engineering was first reported about 1973. There are now noise mitigation strategies to reduce sound levels at nearby sensitive receptors. Motor vehicles operating on roads emit air pollutants, which is a particular problem for congested city streets and other low-speed conditions. Concentrations of air pollutants and adverse respiratory health effects are greater near the road than at some distance away from the road. Traffic may flow on the right or left side of the road, depending on the traffic regulations of each country. In countries where traffic flows on the right, traffic signs are mostly on the right side of the road; roundabouts and traffic circles have to be negotiated counterclockwise; and pedestrians crossing a two-way road should watch out for traffic from the left first. 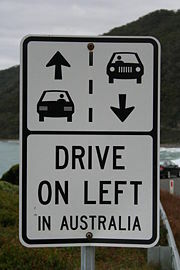 The reverse is applies in countries where traffic flows on the left. About 34 percent of the world's population drives on the left, and 66 percent keep right. By roadway distances, about 28 percent drives on the left, and 72 percent on the right. Originally, however, most traffic kept to the left, worldwide. All-weather road - Unpaved road constructed of a material that does not create mud during rainfall. Bollard - Rigid posts that can be arranged in a line to close a road or path to vehicles exceeding a certain width. Byway - Highway over which the public has rights of way in the United Kingdom for vehicular and other kinds of traffic, but which is used mainly as footpaths and bridleways. Bypass - Road that avoids (or "bypasses") a built-up area, town, or village. Bottleneck - Section of a road with a carrying capacity substantially below that of other sections of the same road. Botts' dots - Non reflective raised pavement marker used on roads. Cat's eye - reflective raised pavement marker used on roads. Chicane - Sequence of tight serpentine curves (usually an S-shaped curve or a bus stop) in a roadway. Chipseal - Road surface composed of a thin layer of crushed stone 'chips' and asphalt emulsion. It seals the surface and protects it from weather elements but provides no structural strength. It is cheaper than asphalt concrete or concrete. In the U.S., it is usually used only on low-volume rural roads. Corniche - Road on the side of a cliff or mountain, with the ground rising on one side and falling away on the other. Curb - Edge where a raised pavement/sidewalk/footpath, road median, or road shoulder meets the regular (unraised) street or other roadway. Curb extension (or kerb extension, bulb-out, nib, elephant ear, curb bulge and blister) - Traffic calming measure, intended to slow the speed of traffic and increase driver awareness, particularly in built-up and residential neighborhoods. Fork (literally, "fork in the road") - Type of intersection where a road splits. Guard rail - Prevents vehicles from veering off the road into oncoming traffic, crashing against solid objects or falling from a road. Green lane (UK) - Unsurfaced road, may be so infrequently used that vegetation colonizes freely, hence 'green'. Many green lanes are ancient routes that have existed for millennia, similar to a Byway. Interstate Highway System - United States System of Interstate and Defense Highways. Median (North American English) - It is the area that separates opposing lanes of traffic on divided roads, including expressways, motorways, or autobahns. It is also known as the central reservation (British English), median strip (North American English and Australian English), neutral ground (Louisiana English), or central nature strip (Australian English). Mountain pass - A lower point that allows easier access through a range of mountains. Milestone - One of a series of numbered markers placed alongside a road at regular intervals, showing the distance to certain destinations. Pedestrian crossing - Section of a road designated to assist in the safety of pedestrians who wish to cross it. Private highway - Highway owned and operated for profit by private industry. Private road - Road owned and maintained by a private individual, organization, or company rather than by a government. Public space - Place where anyone has a right to come without being excluded for economic or social reasons. Ranch road - U.S. road that serves to connect rural and agricultural areas to market towns. Road number - Often assigned to a stretch of public roadway. The number chosen is often dependent on the type of road, with numbers differentiating between interstates, motorways, arterial thoroughfares, and so forth. Road-traffic safety - Process established to reduce traffic collisions and their resultant harm or damage. Roadworks - Part or all of the road is occupied for maintenance work. Shoulder - Reserved area by the side of a road, generally kept clear of all traffic. State highway - Road numbered by the state, falling below numbered national highways (such as U.S. Routes) in the hierarchy of highways. Alternatively, it is a road maintained by the state, including nationally numbered highways. Traffic calming - Set of strategies used by urban planners and traffic engineers to slow down or reduce traffic, thereby improving safety for pedestrians and bicyclists, as well as improving the environment for residents. Traffic light (or traffic signal, stop light, stop-and-go lights, robot or semaphore) - It is a signaling device positioned at a road intersection, pedestrian crossing, or other location to indicate when it is safe to cross the road or intersection. United States Numbered Highways (often called U.S. Routes or U.S. 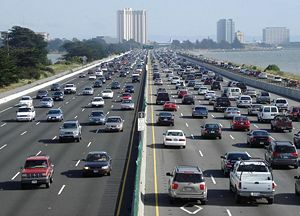 Highways) - They form an integrated system of roads and highways in the United States numbered within a nationwide grid. ↑ United States Geological Survey. March 13, 2006. Major Roads of the United States. Retrieved December 21, 2007. ↑ National Department of Transport. Road Infrastructure Strategic Framework for South Africa. Retrieved December 21, 2007. ↑ Dictionary.com. What is the difference between a road and a street?. Retrieved December 21, 2007. ↑ Douglas Harper, November 2001. Street. Online Etymology Dictionary. Retrieved December 21, 2007. ↑ D. Helbing, K. Bolay, I. J. Farkas, and P. Molnar. 2001. Self-organizing pedestrian movement. Environment and Planning B: Planning and Design 28 (3) (May 2001): 361-383. ↑ Marshalls Heath Nature Reserve. Wheat Hampstead. Retrieved December 21, 2007. ↑ The Icknield Way Path. Icknield Way Association. Retrieved December 21, 2007. ↑ Jona Lendering, Royal Road. Iran Chamber of Society. Retrieved December 21, 2007. ↑ Victorian Powys for Schools. March 2002. The Rebecca Riots. Retrieved December 21, 2007. ↑ Horseboating. The Horseboating Society. Retrieved December 21, 2007. ↑ Horses and Canals 1760 - 1960. The people & the horses. Canal Junction. Retrieved December 21, 2007. ↑ In earlier years, river transport was far easier and faster than road transport, especially considering the cost of road construction and the difference in carrying capacity between carts and river barges. ↑ Kitsap County Road Standards. 2006. Kitsap County, Washington. ↑ Municipal Research & Services Center of Washington. Washington State County Road Standards. Retrieved December 21, 2007. ↑ 17.0 17.1 17.2 17.3 17.4 17.5 17.6 17.7 Shire of Wyndham, East Kimberly, Western Australia (The Last Frontier). October 2006. Guidelines for Rural Road Design and Construction Technical Specifications. Retrieved June 10, 2008. ↑ Adam Hart-Davis, June 1, 2001. Discovering Roman Technology. British Broadcasting Corporation. Retrieved December 21, 2007. ↑ Caterpillar. 2007. Road Building. Retrieved December 21, 2007. ↑ Volvo. 2007. Public Authorities/Government . Retrieved December 21, 2007. ↑ Department of Sustainability and Environment. Glossary. Retrieved December 21, 2007. ↑ S. Kameyama; M. Kato; A. Kawamura; K. Himeno and A.Kasahara. August, 2002. ISAP 9th Conference Titles & Abstracts. International Society for Asphalt Pavements. Retrieved December 21, 2007. ↑ Theodore R. Ferragut; Dale Harrington; and Marcia Brink. July/August 2002. Road Map to the Future. United States Department of Transportation. Federal Highway Administration. Retrieved December 21, 2007. ↑ United States Environmental Protection Agency. December 2003. Fly Ash Concrete Design for Chicago’s 100-Year Road Structure. Retrieved December 21, 2007. ↑ Ludomir Uzarowski, Michael Maher and Gary Farrington, Golder Associates Ltd. 2005. Thin Surfacing - Effective Way of Improving Road Safety within Scarce Road Maintenance Budget. Transportation Association of Canada. Retrieved December 21, 2007. ↑ The Sveriges Riksbank Prize in Economic. Nobel Prize. Retrieved December 21, 2007. ↑ International Market Research Reports. Canada. Retrieved December 21, 2007. ↑ American Road & Transportation Builders Association. State and Federal Gasoline Taxes. Retrieved December 21, 2007. ↑ International Bridge, Tunnel and Turnpike Association. IBTTA. Retrieved December 21, 2007. ↑ Analysis of highway noise. Water, Air, & Soil Pollution 2 (3) (February 1973) Springer Netherlands C.Michael Hogan. Springer Link. Retrieved December 21, 2007. ↑ Traffic-related Air Pollution near Busy Roads. American Journal of Respiratory and Critical Care Medicine. Retrieved December 21, 2007. ↑ 2Pass.co.uk. Why In Britain Do We Drive On The Left?. Retrieved December 21, 2007. ↑ Brian Lucas, 2005. Which side of the road do they drive on?.Brian Lucas. Retrieved December 21, 2007. ↑ World Standards. Why do some countries drive on the right and others on the left?. Retrieved December 21, 2007. Bridle, Ron. 2002. The motorway achievement 2. Frontiers of knowledge and practice. London: Telford. ISBN 0727731971. Brockenbrough, R. L., and Kenneth J. Boedecker, Jr. 2003. Highway Engineering Handbook: Building and Rehabilitating the Infrastructure. 2nd ed. New York: McGraw-Hill. ISBN 978-0071400800. Fein, Michael R. 2008. Paving the Way: New York Road Building and the American State, 1880-1956. Lawrence: University Press of Kansas. ISBN 978-0700615629. Kendrick, Peter S., et al. 2004. Roadwork: Theory and Practice. 5th ed. Oxford: Elsevier Butterworth-Heinemann. ISBN 978-0750664707. Kincaid, Peter. 1986. The Rule of the Road: An International Guide to History and Practice. New York: Greenwood Press. ISBN 0313252491. Lay, M. G. 1992. Ways of the World: A History of the World's Roads and of the Vehicles That Used Them. New Brunswick, NJ: Rutgers University Press. ISBN 978-0813517582. O'Flaherty, C. A. 2002. Highways: The Location, Design, Construction and Maintenance of Road Pavements. 4th ed. Oxford: Butterworth-Heinemann. ISBN 978-0750650908. Shahin, Mohamed Y. 2005. Pavement Management for Airports, Roads, and Parking Lots, 2nd ed. New York: Springer. ISBN 978-0387234649. Post-Roads of Europe 1756-1781. Euratlas. Retrieved December 21, 2007. This page was last modified on 9 December 2015, at 17:05.